Bonito is an ambiguous name that refers to an array of mid-sized fish of the Mackerel family including both the Pacific and Atlantic bonito species. Bonito is a staple of Japanese cuisine but often refers to the Skipjack Tuna species. 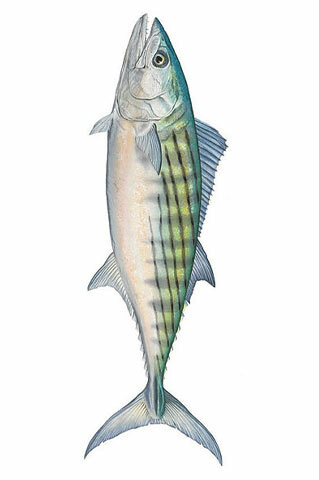 The Atlantic Bonito is an important commercial and game fish found in the shallow waters of the Atlantic Ocean surrounding the coast of Marthas Vineyard. Bonitos are discerned from Tuna by certain differences in color, compressed bodies, and absence of teeth on the roof of their mouth. The Atlantic Bonito shares a habitat with the Striped Bonito. Both are a extremely strong species of fish offering a thrilling catch to both the average angler and experienced fisherman. If you’re goal is to land a Bonito then look no further than Menemsha charter fishing captain Scott McDowell of North Shore Charters. The largest Atlantic Bonito can grow up to 18 pounds, and in some cases measure as much as 30 inches. Are you hunting for trophy Bonito? North Shore Charters is known for finding clients monster fish on a routine basis! Captain Scott McDowell has over 35 years of experience hunting down Bonito in the Vineyard sound. The Atlantic Bonito has distinct physical features that separate it from other species known as Bonito. It has dark stripes on the back-side with a maxillary only half as long as the head. The Atlantic Bonito is known as a strong swimmer which means it is an exhilarating fish to catch. Whether this is your first trip to the vineyard or you’re a veteran fisherman, you will never forget your experience landing Bonitos on the “Lauren C” under the guidance of Marthas Vineyard charter fishing captain Scott McDowell. Stop by the Copperworks craft shop located in the famous fishing village of Menemsha. The Copperworks has a variety of custom one-of-a-kind copper sculptures to complement your Menemsha charter fishing experience with North Shore Charters.